Sticking with Raymond Chandler, his only original script as a screenwriter was this angry noir about a US navy pilot who experiences one of the worst homecomings in all of fiction. Instead of being greeted by a loving spouse, Lieutenant Commander Johnny Morrisson (Alan Ladd) returns from bombing the South Pacific to find his boozy, resentful wife Helen (Doris Dowling) making out with another man at a wild party. Not only that, but she's killed their only son in a drunken car wreck and hasn't told him. Understandably a little perturbed when he hears the news, Johnny explodes and threatens her with his service revolver, only to storm out and leave the monogrammed gun at the scene. So when Helen is found murdered the next morning, Johnny winds up chief suspect and heads out on the run, determined to find the real killer. 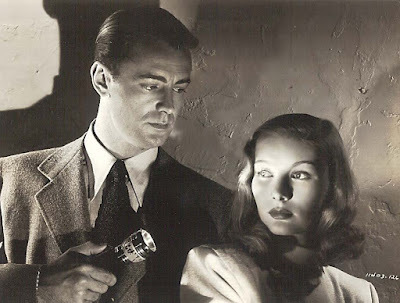 Ultimately, perhaps the problem with The Blue Dahlia is that, without Chandler's original conclusion, it lacks any real social comment or narrative bite. The villains remain blackhatted mobsters and corrupt authority figures in a rather ho-hum, matter-of-fact sort of way. It's just business as usual, an efficient but too predictable off-the-peg studio thriller. However, even with the ending it does have, this need not necessarily have been the case. In a film like John Huston's Key Largo (1948), for instance, much more is made out of similar circumstances. There, the theme is very much that Bogie's returning soldier must accept the need to pick up his gun one more time, to right wrongs on the home front as well as overseas, by ridding his country of sneering hoods like Edward G. Robinson's Johnny Rocco, who dreams of dragging the promised land back to the bad old days. In The Blue Dahlia, they're just bad guys and racketeers. There's really not much more to it than that and Buzz's plight remains a sad side issue. Walter Neff is bleeding. Concealing a bullet wound beneath his overcoat, Neff drives recklessly through Los Angeles, swerving to miss an oncoming truck by inches. He pulls up at the Pacific All Risk Insurance building on Olive Street and staggers inside, shrugging off small talk from a suspicious elevator operator. Alone behind his desk, Neff picks up a dictaphone and begins recording a confession for his boss, claims investigator Barton Keyes (Edward G. Robinson), and so begins the sordid tale of how an easy-going insurance salesman found himself driven to murder for the love of a crooked dame in a cheap anklet and wig. Billy Wilder’s Double Indemnity is right up there with The Maltese Falcon (1941) and The Big Sleep (1946) in the noir canon, a key blueprint for the genre in terms of style, iconography, plotting and characters and remains utterly, utterly seminal. 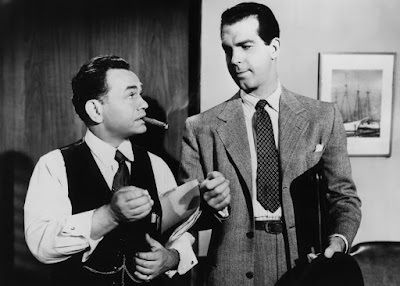 Leads Fred MacMurray (only cast after the illiterate George Raft had again rejected a peach of a part), Barbara Stanwyck (then the highest paid woman in America) and Robinson are pitch-perfect and the dialogue from Wilder and legendary crime novelist Raymond Chandler positively burns. Check out the opening encounter between Neff and hell-bound housewife Phyllis Dietrichson (Stanwyck) below for a taste of that sickly sweet honeysuckle scent that drives men to murder. Also worthy of note is Jean Heather’s very affecting performance as Phyllis’ neglected stepdaughter Lola, the magnificent expressionistic lighting and the sheer ingenuity of the conspirator’s plot. Edward G’s profound, paternal heartache in the final scene, when he lights the dying Neff’s cigarette for the first and last time, is as cute a moment as you're likely to see. In their book Hollywood In The Forties (1968), critics Charles Higham and Joel Greenberg put their fingers on one key reason the film is so effective and it's worth quoting at length: "As in Mildred Pierce, the Californian ambience is all important: winding roads through the hills leading to tall stuccoed villas in a Spanish style 30 years out of date, cold tea drunk out of tall glasses on hot afternoons, dusty downtown streets, a huge and echoing insurance office, Chinese Checkers played on long pre-television evenings by people who hate each other's guts. The film reverberates with the forlorn poetry of late sunny afternoons." 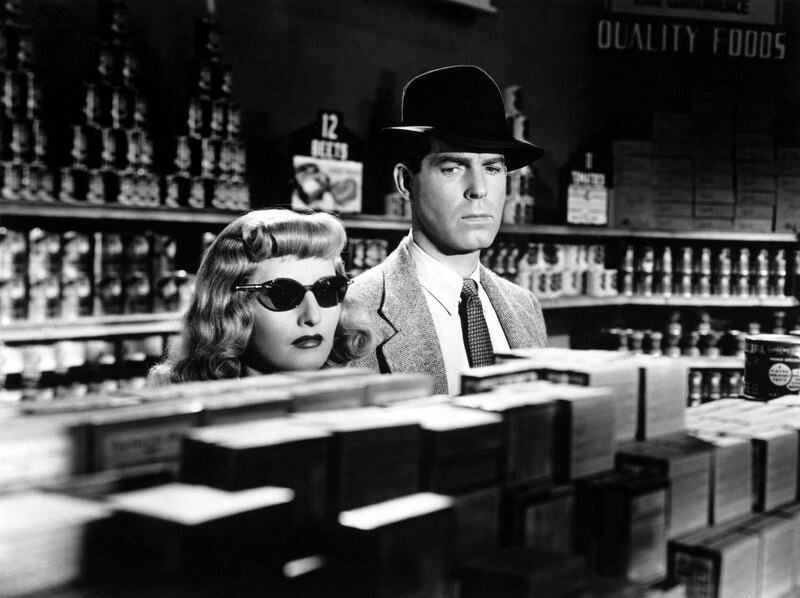 Double Indemnity was based on a 1935 novella of the same name by hard-boiled author James M. Cain, who in turn took inspiration from the real-life case of Ruth Snyder, a New Yorker who was executed at Sing Sing in 1928 for persuading her boyfriend Judd Gray to kill her husband days after the latter had taken out a hefty life insurance policy. Cain had reported on her trial in 1927 while working as a journalist and serialised his story in Liberty magazine eight years later. Cain declared himself delighted with the film adaptation and even applauded Wilder and Chandler for changing his ending, Phyllis going to the chair in Cain's version. A great compliment from a great writer and all the more impressive given that the always-ornery Chandler, then undergoing treatment for alcohol addiction, did not get on at all well with the little Austrian director. Wilder had called him in to replace his usual writing partner Charles Brackett at the last minute after Brackett took exception to the sleazy source material and the pair’s collaboration was, by all accounts, fraught. Chandler did, however, provide Wilder with the inspiration for another masterpiece - 1945’s The Lost Weekend, made to "show Chandler himself" - and appears in a brief cameo in the film, sitting on a bench outside Neff's office. N.B. Fans of Double Indemnity are advised to check out Steve Martin’s inspired use of Wilder’s film, particularly the Jerry’s Market scenes, in his 1982 noir pastiche, Dead Men Don’t Wear Plaid, directed by Carl Reiner.